We are having trouble diagnosing a clonking noise on a 2011 Kia Sorento when moving off or changing from forward direction to reverse direction. We have heard the clonking noise on a few occasions but cannot source the cause of the fault in the workshop. Can you help? Yes, we are aware of this fault affecting Sorento models up to 10/05/12. The noise is due to movement between the front hub and the front wheel bearing. Remove the driveshaft from the front hub. 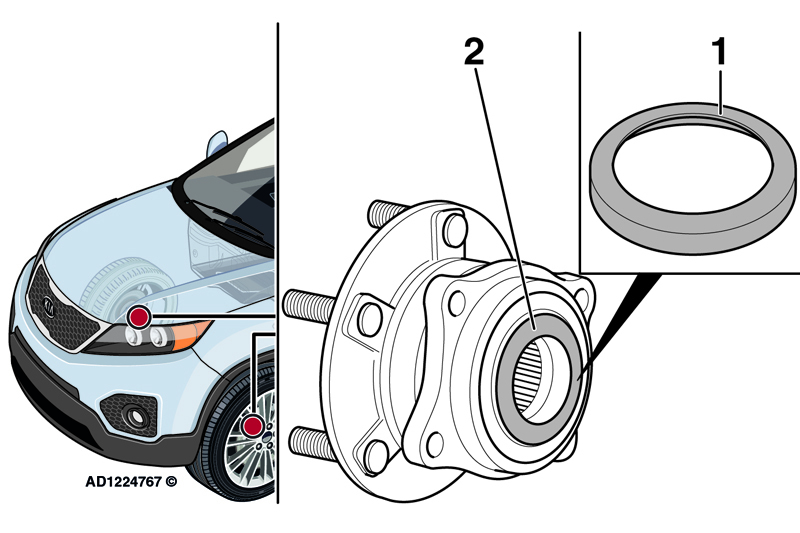 Remove and discard the plastic washer (if fitted) between the front hub and the front wheel bearing (Fig 2.2). Thoroughly clean area. Fit a new metal washer, available from Kia parts department, to the front hub (Fig 2.1). Refit driveshaft. Repeat the procedure for the opposite side. Carry out manoeuvres in the vehicle to confirm that the clonking noise has been resolved.